Instant Mom "Dine Hard" (S01E12): James keeps taking Gabby's things, including some energy drinks she wasn't supposed to have in the first place. [he takes a TON of stuff! I've never seen anything like it!] He's been hiding her possessions around the house for years, but it's an issue Stephanie doesn't have time to deal with at the moment because Charlie has invited his boss over for dinner. He had initially hired a caterer, but Stephanie gets a cooking app and sets out to do it all, including bribe the older children to stay upstairs all evening. [I thought it was funny that Stephanie knew James would ask for $20. also, if that app could handle giving you steps for a whole meal and telling you when to take out the butter to soften, I could've used it for Thanksgiving!] 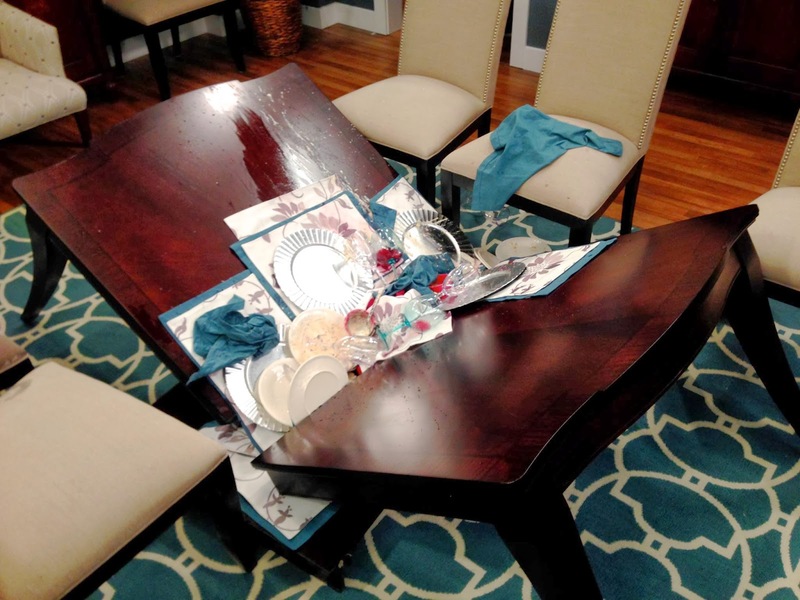 Maggie brings over a back-up dinner of chicken marsala, which Charlie secretly requested, and then while Stephanie and Charlie struggle with extending (and break) the dining room table, Maggie drinks the expensive wine Stephanie was decanting and replaces it with sherry. [gross! as was Maggie needing $40 to stay quiet about what she did to help.] Then, James salts the pate, thinking it's the squab for which the app is calling out directions. So, when the boss arrives, there are no appetizers, and she starts saying terrible things about Stephanie being the "second wife and mother." [couldn't she see him come to the door and then wait to answer?] Charlie panics and invites the children to join them for dinner, even though there is not enough food. [then give the kids some spaghetti, no?] It gets worse when Aaron consumed one of the energy drinks and is bouncing off the walls, but still goes downhill when the squab is burned because James and Aaron accidentally tossed some of Gabby's stuff into the mix when they were hiding it. [and Charlie didn't even seem to make them apologize!] They eat Maggie's chicken, but the dinner is ruined anyway when the kids start a war while eating creme brulee, as the boss is spilled on multiple times. She insults the kids, forcing Stephanie to stand up to her. By the time the able breaks, the evening had been sufficiently ruined.